Picasa Web Albums service, which is Google's answer to Yahoo Flickr, has gone live today. Like other Google beta services, Picasa Web is open by invitation only. We had a chance to try Picasa Web Albums and our first impression is that it is very inspired by Flickr but not anywhere near. Here's a first hand comparison of Picasa Web Albums with Flickr based on several parameters like prices, storage, ease of use, features, etc. Flickr Pro charges $25 for uploading upto 2GB of pictures per month while Google charges the same price for uploading 6GB of photos per year. Therefore, Flickr provides 4 times more storage space than Google at the same price. 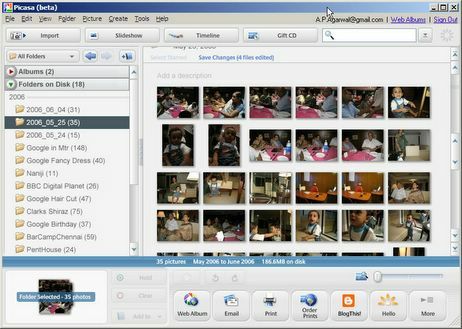 For free accounts, Picasa users are limited to 250 MB of space while Flickr lets free users upload upto 20 MB per month. So the storage limit is roughly the same for both services. Also, there is no bandwidth limit in either of the servies. Both services provide a web browser interface for uploading pictures. When it comes to software, Flickr has a very basic Flickr Uploader software while Google has integrated the photo uploader right in the Picasa software itself. However, Flickr provides other photo uploading options like Mobile Phones and email. Unlike Flickr, Picasa Web has no support for tags. You can attach labels to individual images or an entire photo album in Picasa Photo software but that doesn't reflect in the web albums when you upload a photo. Both services allow you to add captions to pictures but Flickr automatically parses text and converts URLs into clickable hyperlinks. Flickr allows users to visually mark certain areas of the picture by drawing a marquee and attach a description and even a link to that area. For instance, in a group photo, you can mark your face and link it to your website. Picasa Web Albums have no such feature. Both services allow users to post comments on other pictures. In Flickr, you can also subscribe to your recent comments feed. Both services allow users to add any public picture to their favorite folder. Both Picasa Web Albums and Flickr provide RSS feed for all photos from a user or selected album (or photoset). However, in Flickr you can subscribe to photos based on Tags. Flickr allows download of individual photos while Picasa goes a step further and lets you download all pictures in a web album. However, Flickr provides various size options when you download a picture. We miss this in Picasa. Flickr exposes a nice API that has been used to develop some amazing web-apps like the Flickr Graph. Google Web Albums provides no API. Flickr lets you directly publish a photo to a blog. You can do this from Picasa locally but not from the Web Album interface. Picasa provides an extremely easy program to upload photos online. You can visually select files and folders in Picasa, save them to the tray and upload all of them in one go. Picasa Slideshows are much easy to customize as they are done in HTML code. Flicks is a more mature and robust application than Picasa Web Albums. Flickr supports tags and photo clusters which make the task of finding relevant photos so easy. Unlike Picasa, Flickr provides communities and photo pools where anyone can join and share related pictures. Flickr has an active support community and your Flickr related queries are answered almost instantly. Also, Flickr has an API for programmers. Conclusion : Take the Flickr route. I would probably use Picasa Web Albums for storing picture backups but Flickr remains my favorite service until Google introduces tags, communities and more photo uploading options.